Neither Chris McDaniel, the conservative firebrand vying for Mississippi’s U.S. Senate nomination today, nor the six-term establishment Republican incumbent he is challenging, Thad Cochran, is likely to be the future of the GOP. They’re not even great campaigners. Why, then, are so many Washington, D.C.-based Republican aides and operatives fixated on this race, a bitter fight between two gaffe-prone men with on-the-ground operations so strained they can barely keep up with a deluge of national requests pouring in their way? Some of these observers say that what happens today in the Magnolia State will speak to the GOP’s ability to unite and stop cannibalizing itself and will have implications for Republicans’ chances of winning back the White House in 2016. Others see it as a mean-spirited race to the bottom between two deeply flawed candidates: Cochran, a 76-year-old who has been in the Senate since 1978, and McDaniel, a 41-year-old upstart selling himself as another Ted Cruz at a time when the Capitol barely has room for the original. But the clearest message from Mississippi likely won’t be a final judgment on the tea party, because what’s been happening in the GOP primary process has been about a lot more than policy disagreements since the movement burst on the scene in 2010. It’s also about money — in particular, the money to be made in GOP political circles by challenging incumbents and surfing the wave of tea party hopefuls. And those challenges mean that even when establishment candidates win, they will have had to campaign harder, longer and more ideologically than in decades. If Cochran defeats McDaniel, GOP officials say, the new cottage industry of Republican operatives who lend their “expertise” to inexperienced candidates for a high fee — thus both fomenting and profiting off the proliferation of conservative challengers — will get a comeuppance. Outside groups have spent more than $8 million in Mississippi, much of that either in opposition to Cochran or support of McDaniel, according to the Center for Responsive Politics. The action PACs for the Club for Growth and Senate Conservatives Fund, established by former Senator Jim DeMint of South Carolina, spent approximately $2.5 and $1.1 million in Mississippi, respectively. Meanwhile, the official campaigns burned through cash. Through mid-May, Cochran raised $3.67 million while spending $3.48 million, and McDaniel raised $1.27 million while spending just over $1 million of that. It doesn’t leave much left in the coffers for the start of a general election, though in a red state like Mississippi, that does not matter as much, even if the question of “to what end?” still looms. Republican Richard Burr of North Carolina, which had its own contested GOP primary last month, was a bit more charitable about the forces driving the emerging new normal of competitive primary elections in the GOP. “I don’t begrudge anybody who is out trying to make a living. And [with] that many candidates, you’re going to have that many consultants,” he said. In the end, divisive primaries are the fault of aspiring politicians, not consultants, he suggested. “I don’t think much of D.C. consultants to start with, but that is a choice that candidates make,” he added. “In every case so far, that’s been the winner. 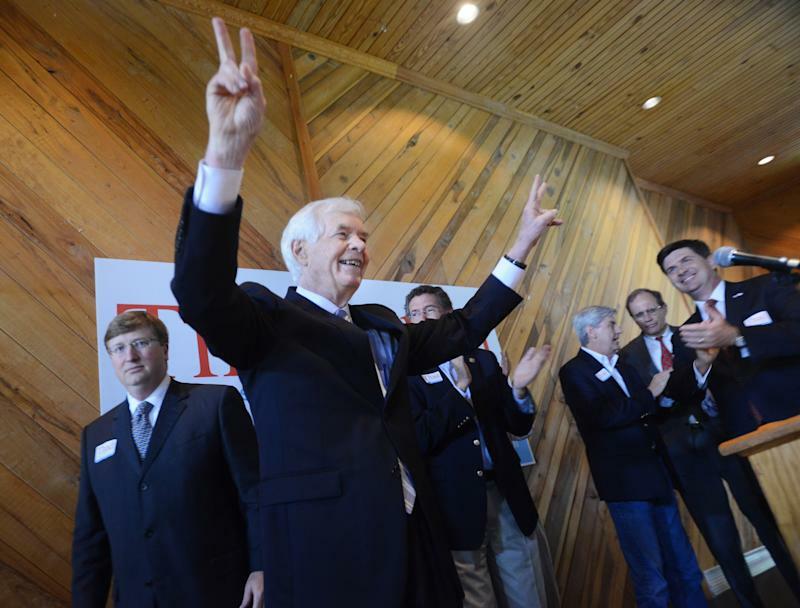 And I think it will be that way in Mississippi with Thad Cochran,” he said. But not everyone is so confident about Cochran’s chances, and the story of his seventh campaign to be senator is one of the most bizarre in recent off-year cycles. “I’m about done chatting. I need to go,” Wicker said abruptly to closing elevator doors as Yahoo News tried to pose a follow-up question. Multiple Capitol Hill sources report that Cochran frustrated Senate Republican leaders by delaying his decision on whether to seek re-election until December. Senate Minority Leader Mitch McConnell, R-Ky., preoccupied with a primary contest of his own, wanted his fellow senior Appropriations Committee colleague to make up his mind sooner, so that if he bowed out, establishment Republicans would have enough time to boost a chosen successor. Cochran’s wait opened the door to McDaniel’s challenge while closing the window for another more seasoned establishment candidate to step in. Despite the high profile of his contest, Cochran has run a low-visibility campaign and sought to avoid moments that might show him at his most unscripted. Brief one-on-one interviews with select reporters have comprised Cochran’s media strategy of choice. He even announced his campaign that way: In December, just six months before the primary, Cochran granted an exclusive one-on-one interview with a local Gannett newspaper reporter in Washington to announce his re-election bid. In the past week, he has done short interviews with Politico and the Washington Post, even as the National Republican Senatorial Committee said he was focused only on local reporters. Yet even in those intimate settings, Cochran has struggled to issue clear statements on simple questions about his views, leading his campaign to issue clarifying statements after the fact. In a cycle where the only incumbent to lose was 91-year-old Rep. Ralph Hall of Texas, McDaniel and his allies have tried to make Cochran’s age — more than 30 years greater than that of his challenger — into an issue, sometimes in subtle but often in overt ways. The defining event of the election was a break-in by McDaniel supporters into a Mississippi nursing home where Cochran’s wife — who has suffered for many years from dementia and is incapacitated — resides, in a bid to raise controversial questions about the incumbent’s life. Three people have been arrested in conjunction with that gambit. “You’re hard-pressed to find a person who likes Cochran who wanted him to run. He is so well respected in the state, has done so much for the state, that people didn’t want him to go through” what they knew would be a brutal campaign, a Republican congressional aide with knowledge of the situation told Yahoo News. “No one wants to age like that on C-SPAN,” the aide added. In the end, Cochran was the establishment’s best hope at keeping McDaniel — who enraged many Mississippi voters when he said he didn’t know how he would have voted for Hurricane Katrina relief legislation — out of Congress. “Senator Cochran will breeze to re-election, and this will be something that’s a footnote in history, not a prediction of the future,” predicted Burr, the North Carolina Republican. It’s possible that in the future, Tuesday’s election day in Mississippi will be just that, a footnote. But in the short term, there's sure to be a flood of questions about what the outcome means for the larger story of the Republican Party.